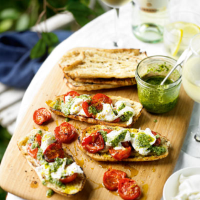 Set your picnic off to a great start with this tasty mixture of summery flavours. The pesto is whizzed up in a couple of minutes and is best made several hours ahead or the day before so the flavours can develop. If changeable weather means staying at home, it makes a tempting lunch dish too. 1. Preheat the oven to 170ºC, gas mark 3. Brush a roasting tin with a dash of the oil. Arrange the tomatoes in the tin, cut sides face up. Drizzle with the remaining oil, the sugar and a little pepper. Cook for about 1 hour or until the tomatoes are slightly shrivelled and beginning to colour. Leave to cool. 2. To make the pesto, put the basil, pine nuts and garlic in a food processor with a little of the oil and blend to a thick paste, scraping the mixture down from the sides of the bowl so the paste is smoothly blended. Add the remaining oil, cheese and salt and blend again until evenly combined. Transfer to a container or bowl, cover and chill. 3. Toast the bruschetta, leave to cool and wrap in foil. Drain the burrata into a container and add the tomatoes. To serve, tear the burrata into pieces and scoop onto the toast with the tomatoes. Spoon the pesto on top. This recipe was first published in Tue Jul 23 12:06:00 BST 2013.